Homily for the First Mass of a Newly Ordained: "What Is Man That You Are Mindful of Him?" Oftentimes, a newly ordained priest asks another priest to preach the homily at his first Mass. I was honored this week to preach at the first Mass of newly ordained priest, Fr. Thomas Gignac. Fr. Tom was a member of my parish when he entered the seminary six years ago. It was a great joy to see him ordained a priest this past Saturday. Praised Be Jesus Christ! Every few months or so, the news hypes up the fact that the Powerball jackpot has reached some astronomical number. 400 Million, 500 million. I think not too long ago it even hit a billion! In the days leading up to the drawing, people are crazed as they buy tickets and discuss what they are going to do with the money when they win it. Admittedly, I am one of those people. A few hours before the drawing, I run down to the store, buy a ticket, and for a few hours, I think about what I am going to do with that money. Inevitably, I wake up the next morning to discover that somebody in Oklahoma or West Virginia has won. The media abounds with good news about these deserving folks who have won. I have to be honest, while I may feel some level of happiness for them, it doesn’t come anywhere close to the happiness I would feel if I had won instead of them. Maybe it is selfish, but the fact that some people far away from me whom I don’t even know have won, doesn’t really do much for me. Today, we celebrate the Solemnity of the Most Holy Trinity. The Catechism of the Catholic Church tells us that God is infinitely perfect and blessed in himself. He is a communion of persons. A communion of perfect love. Sometimes, when we think about God and when we talk about God, we do so in a very distant or remote way. God is way out there somewhere and we are way down here. God is out in Oklahoma and we are in Methuen. God is infinitely perfect and blessed, but we aren’t. In 1961, the Soviets launched the first man into space. As part of their atheistic propaganda, they would say, “When the cosmonauts got into space, they looked and looked but didn’t see any god.” The reason they said this was to mock religion, but we sometimes live like this too. We think of God as far away, disconnected from us, remote, and distant. In contrast with the Soviet propaganda, today’s psalmist looks around at the universe not with cynicism but rather with awe. he sees the seas and rivers teeming with life, he sees the hills and the fields and all living things . . . he sees it all and he is overwhelmed. He looks at the grandeur and majesty of the created realms and after seeing all of this he wonders aloud, “What is man that You are mindful of him?” Yes, the psalmist knows that the author of the creation cares about him, loves him, and is close to him. God, it is true, is infinitely perfect and blessed in Himself. But, the catechism goes on to teach us, that God freely created the human person in order that each of us could become sharers in His own Blessed Life. He draws close to us. He invites all of us to share in the wealth of his love and blessedness! God wants us to share in HIS riches. To accomplish this, God sent His Son into the world. In Christ, God came to dwell among us. And, as St. Paul tells us today, God gets even closer than that! St. Paul declares that God has poured his love into our hearts. He not only creates things for us. He not only comes to dwell among us, but he pours His Holy Spirit into our hearts and makes his dwelling within us. God is not way out there--remote from us and distantly enjoying the communion of love that He himself is. No, he comes to dwell within us. He pours himself into our hearts so that we might share in this communion of love. Yesterday, the Holy Spirit was poured out onto our brother, Tom. St. John Paul II once wrote that the priest prolongs the presence of Christ the Good Shepherd in the midst of the flock. In other words, Fr. Tom received the outpouring of the Holy Spirit in order to continue the mission of Christ himself--to draw human beings into the communion of the blessed life of the Trinity. Fr. Tom--through the ministry entrusted to him by Christ, will be a minister of the infinite riches of Christ. Fr. Tom will announce God’s nearness, but more amazingly, he will be be an instrument that unites us to God. Those to whom Fr. Tom ministers will become sharers in the communion of love. The Holy Spirit was poured out upon Tom yesterday so that others could share in the joy of God’s nearness. The Blessed Trinity wants all to share in their Communion of Love. When Fr. Tom speaks the words of the Holy Gospel, he will announce to everyone the nearness of God. Overwhelmed by such undeserved love, we are filled with wonder and awe: What is man that you should be mindful of him? When those who have grown distant from God through sin hear Fr. Tom speak the words of absolution over them, they will know the nearness of God. Overwhelmed by such undeserved love, we are filled with wonder and awe: What is man that you should mindful of him? Those who are sick and dying--those who often feel afraid and distant from God--will know God’s nearness when, in the middle of the night, Fr. Tom comes to bring the Anointing of the Sick. Overwhelmed by such tenderness and undeserved love, we are filled with wonder and awe: What is man that you should be mindful of him? Most importantly, Fr. Tom’s hands will feed the faithful with the Body and Blood of the Lord. 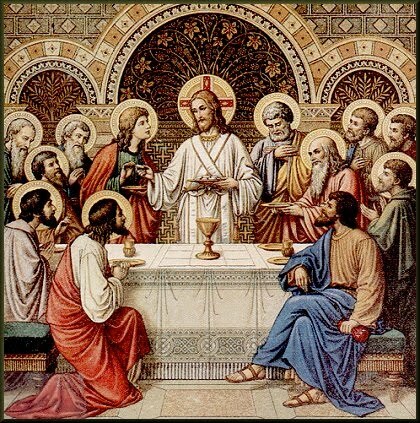 Jesus himself said, “Whoever eats my Flesh and drinks my Blood has eternal life.” Fr. Tom will feed others with the Bread of everlasting life. They will actually taste and see the nearness of God. Overwhelmed by such undeserved love, we are filled with wonder and awe: What is man that you should be mindful of him? Kruschev said that he sent the cosmonauts all the way up into space, but they didn’t see any god. Today, and every day for the rest of his life, Fr. Tom ascends the steps of the altar--only a few mere feet above the ground. And, in His hands, he will hold God. He will show us God. From his hands, we will receive God. And through his ministry, he will lift us up to God. The Father, the Son, and the Holy Spirit are a perfect communion of love. And God has chosen us to be sharers in that love. Fr. Tom will spend the rest of his life being the presence of Christ, the Good Shepherd in the midst of the flock. Fr. 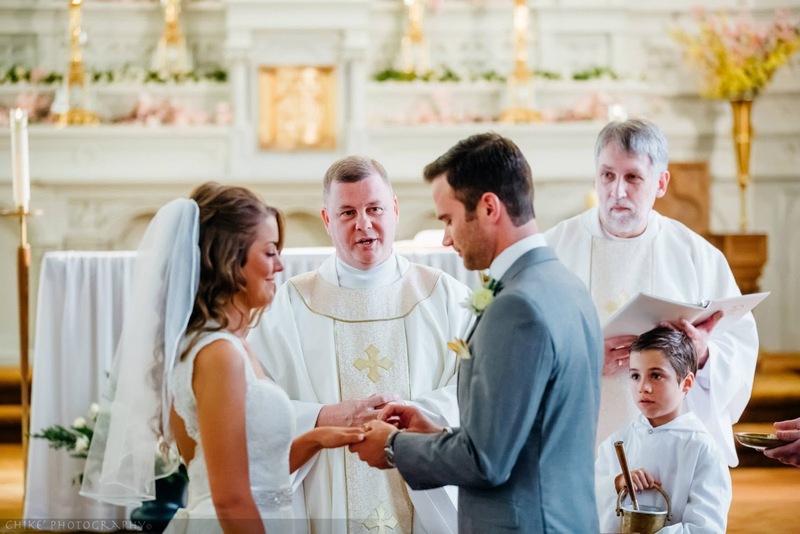 Tom is a priest so that God can draw close to us and so that we can receive the riches of God’s manifold love. Today, overwhelmed by God’s closeness and love, overwhelmed that he is mindful of us and cares for us, overwhelmed that He has poured out His love into our hearts, we bow down in humble adoration and join the chorus of all of those who have been made sharers in the riches bestowed by Christ: Glory be to the Father, and to the Son, and To the Holy Spirit. As it was in the beginning, is now, and ever shall be, world without end. Amen. Nineteen years ago this morning, I woke up early, drove to Castle Island in South Boston, and prayed the Divine Office and the Rosary. After that, I drove to the Cathedral of the Holy Cross and was ordained a priest with eleven other men. Last night I was having dinner with a priest who was ordained fifty years ago. Suddenly, my nineteen didn't seem very impressive! One of the beautiful prayers of the Extraordinary Form of the Mass is spoken at the foot of the altar. "I will go to the altar of God, to the God who gives joy to my youth." While the form of the words is found only in the Extraordinary Form of the Mass, the reality is found in every Mass. Almost two decades after I first offered Mass, I still feel like a new priest. I'm still learning. Every day, when I meet Christ at the altar, he renews the joy of my youth by offering me the opportunity to become more like Him. When a priest reads in the gospels about the calling of the apostles, he cannot help but be reminded of his own call. And although that call may have occurred nineteen, forty, fifty, or sixty years previously, it is not something that is relegated to a moment long ago. It is something that is renewed daily. His invitation to "go out into the deep," is a present experience. One of the great privileges in my life has been to witness the Lord Jesus call other men to the priesthood. Some of them have been ordained and some of them are still in the seminary. I love knowing that their hearts are experiencing the awe and the joy of being called by the Lord. Every priest knows what this feeling is. You hear the Lord's voice calling you, and you think, "He can't be talking to me." But, there it is. His gaze meets yours and, even though you know what is happening, you think that this must be a mistake. You feel like Peter when he fell to his knees and said, "Lord, leave me for I am a sinful man." But, you know. You know that your life is no longer your own. You are His. What makes me particular happy for these men whom God continues to call to be shepherds is that this call will never lose any of its newness and power. It won't fade or grow dim with the passing of time. It is renewed and strengthened daily. Oh, they will have to "bear their share of hardship for the Gospel" (2 Tim 1:8). In fact, that hardship may increase over time. More and more, they will be conformed to the Mystery that they offer daily at the Altar. But, this Mystery will also renew the joy of their youth. When I look at these new priests and seminarians, it fills me with joy that they have a lifetime of newness ahead of them. The call that they hear at present will be renewed daily in their life. The surprise of their vocation will only deepen and grow. Jesus calls priests in order to make visible in the midst of the flock the presence of Christ the Good Shepherd. Daily drawing closer to the Good Shepherd and drawing closer to His flock, the priest is renewed and sanctified. It is a mystery, a great mystery. When I first heard the Lord calling me, I knew it was big. But, the depths to which His call beckons only grows with the passing of time. Closeness to the Shepherd and closeness to the flock . . . it is a privilege beyond compare. When I offer Mass today, I will do so in thanksgiving to God . . . to God who gives joy to my youth. 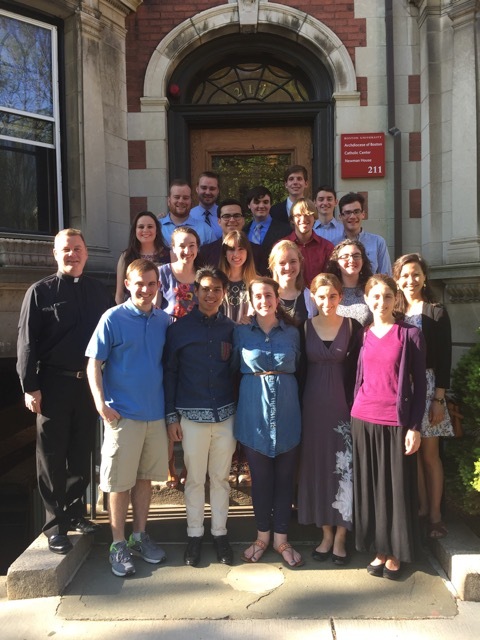 This week at the BU Catholic Center has been "Senior Week." Most of the students have returned home for the summer, but the campus is now filled with Seniors and their families. A lot of the Catholic Center students are also around campus this week. Some of them will be here all summer, either taking classes or working at the University or in the Boston area. In fact, daily Mass this week has been more crowded than usual. Today--Saturday--is kind of my day off. I came in this morning and prayed my Holy Hour and then got to work on an important project--the Wall Street Journal Crossword Puzzle. I took the hound for a walk, played fetch for interminably long periods of time, and did some spiritual reading. Joe, our intern, showed up in the morning to pray the Breviary, and then went off to one of the individual school graduations. Afterwards, he returned and prayed a Holy Hour. We had a Mass this evening for the seniors who are graduating tomorrow and for their families. As I offered that Mass, I thought about what a blessing it is to be with these young men and women. They really love God. For them, Catholicism is not a political agenda or one theory among many theories. No, they are disciples. They are young men and women who are living discipleship. It's such a cool thing to walk into our little house chapel and almost always find someone in there praying. After Mass this evening, a small group of about a dozen undergrads and our intern and I cooked dinner together. It was a very enjoyable evening, talking, laughing, and eating. This to me is Catholicism. During this day, we prayed together, offered Mass together, dined together, conversed together, and laughed together. At the end of our meal, we gathered around our humble statue of the Blessed Virgin Mary and chanted the Regina Caeli together. Nothing in this post is particular earth-shattering. It's just a reminder that the Holy Spirit is still at work in the life of the Church. He is still building the Church and making all things new in Christ. He is still drawing souls up and into the Divine Life. What makes me most grateful is that it is all real. The friendship, the prayer, the devotion, the worship, and everything else . . . it is real. It is not contrived or some sort of commercialization of the Faith. It is real. It is human. It's fun, but it is also substantial. Before, during, and after Mass tonight, at dinner tonight, at Holy Hour today, and in a thousand other small gestures that are part of our life together, what is obvious is that it is all real and all truly human. Grace doesn't destroy nature. It builds upon it. Today we lived together the mystery of discipleship. It's intentional, but it is not contrived, manufactured, or gimmicky. Today, I was surrounded by young men and women who love each other, pray with each other, eat with each other, serve with each other, and laugh with each other. They are living life together, but they are living that life in Christ. Today is the Solemnity of Pentecost. The Holy Spirit breathes life into the Church. Today, I was privileged to inhale that breath. Recently, someone asked me what are some of my favorite parts of being a priest. I know that the answer should revolve around the Sacraments. Please don't get me wrong. I love preaching at Mass, offering the Holy Sacrifice, hearing confessions, anointing the sick, baptizing and confirming, and witnessing marriages. I'm a liturgical kind of guy. I LOVE being a minister of the Sacraments. But, there is another part of priesthood that I love too. I love being a priest on the stairs. Both when I was a parish priest and now as a university chaplain, I love standing on the stairs before Sunday Mass. It's where I get to talk to people, hear about their lives, and receive requests to hear confessions. When I was a parish priest, I would often sit out on my rectory porch in the nice weather and read my book in the evenings. So many people would stop by to talk. Some were people who never came to church. Some were people I saw at Mass but never really got to know. But, when you sit on the front steps of your house on the main street, people feel comfortable stopping by and chatting. Police officers would pull over and get out of their cars to chat, runners would pause to say a quick hello, and troubled souls would engage in conversation. This evening the Boston University Catholic Center hosted an evening for our seniors. We had Mass together and then dinner. Our Office Manager, Fran, did her usual heroics and cooked dinner for about 25 people. She decorated, cooked a feast, and cleaned. She's a gem. Meanwhile, we went around the table and talked about what the students would be doing when they graduate and we asked them to share some memories of their time at the BU Catholic Center. It was really a very beautiful conversation. After dinner was over, a good crowd of us went and sat on the front steps of the Catholic Center for well over an hour. We laughed, told stories, and enjoyed each other's company. When I suggested that "this is really nice," they were sure to say (mockingly), "Yes. It is very human." (That is one of my "go to" comments.) Yes, it is very human. This is what is missing from so much of life. To me, this is what the Church is. There was, in fact, something very humanizing about our evening. We were living something beautiful together. If you were a student living in any of the other buildings along our street or if you were a passerby, you would have looked tonight and thought, "Those people seem so happy together." What I love about the Catholic Center is that it is never an "either/or" proposition. It is not a matter of choosing between the Sacraments or the Stairs. We live out the whole Catholic life together. 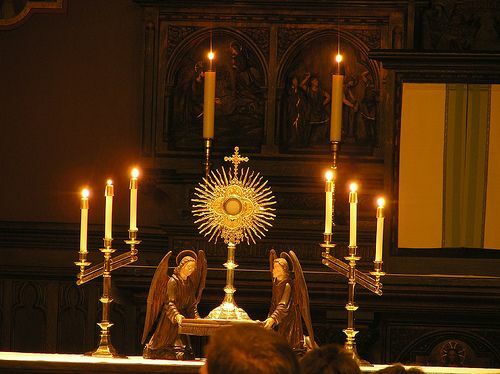 It is a place where Adoration, Almsgiving, Friendship, Worship, Confession, Mass, Frisbee, eating, socializing, goofing around, and a thousand other "human" gestures are lived out daily. Tonight, as we hung out on the steps and I repeated the same stories that I've told a hundred times, we loved each other. What happens on those steps is the result of living a Sacramental life together in the chapel. If anyone were looking down from their buildings and saw and heard us as we conversed, they would have to say, "Those people love one another." And , they'd be right. We love each other, not just as people who happen to be fond of each other. We love each other because we have encountered the Love of God in Christ Jesus. If I were to write a book on the priesthood, sure there would be chapters about the priest at the altar, in the confessional, at the deathbed, and in the pulpit. But, there would most definitely be a chapter entitled, "The Priest on the Stairs." Tonight, I am very grateful to be a priest and I am very grateful for the stairs that the Lord has given to me. I am also grateful for the many people who have shared a place on the stairs with me. Msgr. Luigi Giussani once spoke about how the early Church grew because, day by day, people noticed a small group of Christians gathering together at Solomon's Portico together. Eventually, people became curious and wondered what this small group was all about. Gradually, one by one, this grew into the Universal Church. Tonight, I am grateful that on the stairs of the Catholic Center, we have our own Solomon's Portico. The more we pray together and live a friendship together, the more attractive that becomes to others. Being on the stairs . . . it's not a gimmick or a program. It's just Catholic friends living life together. When Catholics live a Sacramental life together and seek to follow Christ, what happens on the stairs becomes an invitation to others. I am grateful tonight for our community. It was good to be with them in the chapel, at the dinner table, and on the stairs. What happened at Solomon's Portico two thousand years ago is still happening today. We are loving God and loving each other. And that, is how the Church grows. This morning, the street where the BU Catholic Center is located was filled with students moving out for the summer. Another academic year has come to its conclusion. I arrived at BU this morning and met the young man who is our intern, and he and I had Mass together. After that, I had lunch with a recent graduate from BU who is now in the seminary. Later in the day, after I left the Catholic Center, I allowed myself to get dragged into a nonsensical conversation about politics. While I know that politics are an important part of life, the conversation made me--once again--realize why I am happy at the BU Catholic Center. It's because I get to spend my whole day being real and talking about things that actually matter. We spend our lives together engaging in meaningful conversations about what is good, true, and beautiful. We talk about God, about vocations, about the Church, about virtue, about holiness, about what it means to be fully human. We talk about the struggle to overcome sin and the desire to grow in virtue. I get to spend life with young people who are not cynical, who are not interested in rehashing tired old political slogans. They don't think politics are the answer to every problem. Instead, these young people want to talk about prayer, grace, holiness, and charity. When we converse with each other, the desire is to help each other to come to a deeper love for the Truth; a deeper love for the Lord. Conversations at the BU Catholic Center are real. They are often filled with the humor of people who love one another. The conversations arise from a communion of life. We pray together, worship together, hang out together, and love together. Our life is about serious things. It's joyful. It's a life that revolves around the sacraments. Together, we talk to God and we talk about God. One of the great graces of being a priest at the BU Catholic Center is that there is no ideology. It's all about loving God together and announcing to others that same love. It's joyful. It's real. It's something that makes your soul expand and your humanity deepen. What strikes me about the young people at the BU Catholic Center is that their starting point is the love of God. They don't use the Gospel or theology simply as arrows in their political quiver. They love God and that is where they begin. Today, I engaged in a few conversations. Two were about God, the sacraments, friendship, the priesthood, vocations, and prayer. The other was about politics. From the first two I walked away recognizing that I was more human and closer to God as a result. From the the latter, I walked away feeling smaller, more petty, bored, and more distant from the Lord. In the months ahead, political conversations will dominate the airwaves. Allowing them to dominate our lives would be a mistake. Yes, political discussions are important, but they are rarely edifying or sanctifying. A young woman who is graduating will give a couple of year's service as a FOCUS Missionary. Another young woman who is graduation will be going to NET Ministries as a missionary. Our intern who graduated last year and who has given a year of service to our community will be entering the seminary. A young man who graduates this year will be giving a year of service to our community next year. A couple of our members emailed students who are moving out for the summer and asked them to donate extra clothes to the poor (offering to come and pick the clothes up from their dorms). Scores of students attended Bible Studies during the course of this year. Scores of students attended retreats and formation evenings throughout the year. Scores of students went to confession frequently, attended daily Mass, did Holy Hours before the Blessed Sacrament, and came to spiritual direction throughout the year. Many other amazing things happened during the year. Young people loving God, drawing closer to Jesus Christ, and sharing the Gospel with others. So beautiful. My point? I'd rather talk about those things, be engaged in those things, and be lifted up by those things than to waste my life talking about Hillary Clinton and Donald Trump. Talking about God and helping one another love God is infinitely more interesting, humanizing, and divinizing than regurgitating tired, old, ideological, political slogans. Political banter--like talk shows--is mostly nonsense and boring. I am grateful--very grateful--that I spend the vast majority of my life surrounded by men and women who engage me in conversations that are truly edifying and truly uplifting. Today, I was engaged in various conversations. Some had to do with Hillary Clinton, Donald Trump, Republicans, Democrats, liberals, and conservatives. The other conversations had to do with Jesus Christ, prayer, vocations, the Church, and holiness. The former left me feeling less human, less alive, and discouraged. The latter left me feeling holier, built up, and encouraged. When given the opportunity to talk about Jesus Christ or Hillary and Donald: Choose Jesus Christ. That's my advice and I'm sticking with it.